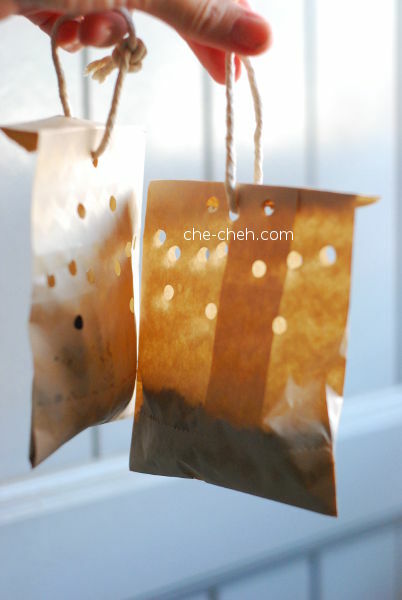 In this post, I’m going to show you how to DIY air freshener with used coffee grounds. Yes, no more buying commercialized air freshener and creating unnecessary waste. Also at the same time, you get to save money; used coffee grounds are free! I’ll let you on a tip. Read on. The most important thing you gain when you switch to natural air freshener is your health. You and your loved ones are no longer exposed to chemicals that are found in commercialized air freshener. Coffee grounds air freshener is as natural as you can get. 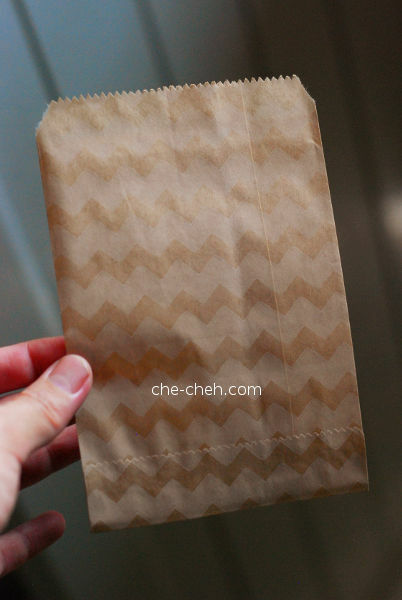 First thing first, you will need several paper bags like this one. Fold the opening two to three times (A, B, C) and punch a hole in the center. This is for stringing. 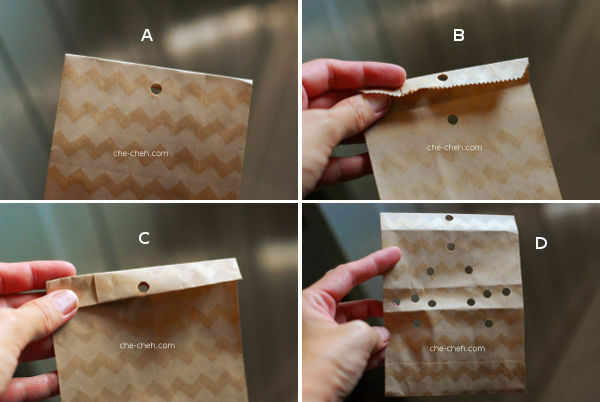 Then punch a couple more holes on the paper bags (D). This is so that the coffee grounds can breathe and do its thing. Don’t punch too low as you will be filling the bag with coffee grounds and you don’t want them to pour out. 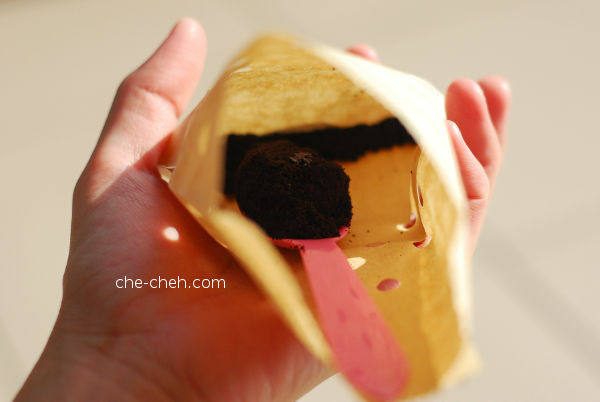 Fill the bag with dried coffee grounds and fold the opening. Dry the coffee grounds under the sun or in the oven or dehydrator beforehand. Tip #1: Make sure you dry the coffee grounds before using. If it’s wet, it may get moldy and attract insects. If you’re a coffee drinker with leftover coffee grounds every time, that’s good news. But what if you drink instant coffee or you don’t drink coffee at all? Where can you get coffee grounds? Tip #2: Starbucks provides complimentary coffee grounds in all their stores. 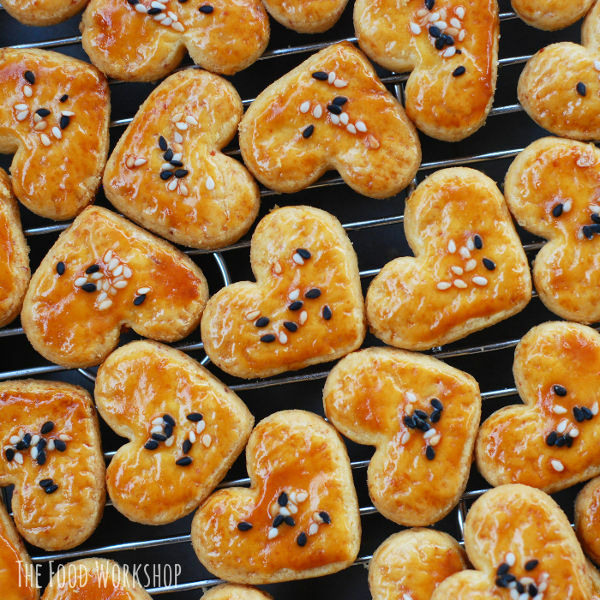 Drop by and grab a bag or two. If they’re none, ask the staff and they will pack it for you. They use plastic bags for packaging, unfortunately. If you see they’re not that busy, try asking them to pack the coffee grounds into your own container. String the DIY air freshener with cotton or hemp twines and WAH LA! I use these in the toilet, laundry room, living room and car. Once it’s no longer absorbing odor (how to know? Smell the room! 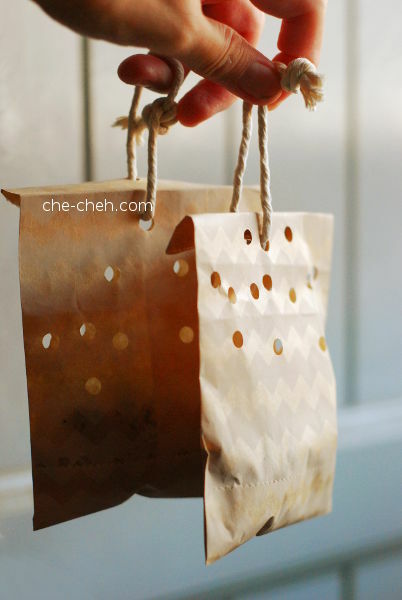 ), I reuse the paper bags and strings. As for the coffee grounds, I return ’em to earth by feeding my plants or compost them. Since the bags and strings are natural, I can also compost them.